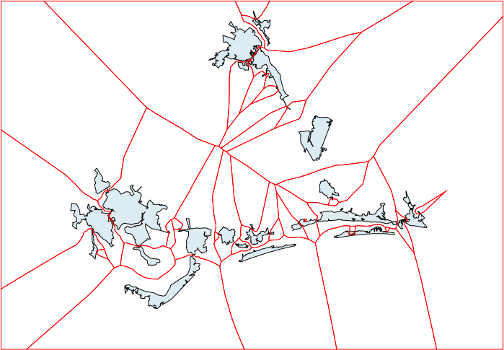 v.voronoi - Creates a Voronoi diagram in current region from an input vector map containing points or centroids. Applies to input areas only. Smaller values produce smoother output but can cause numerical instability. Applies only to skeleton extraction. Default = -1 will extract the center line. v.voronoi creates a Voronoi diagram (Thiessen polygons) from points or centroids. The bounds of the output map are limited by the current region (see g.region). The -a flag can be used to create a Voronoi diagram for areas. The -s flag can be used to extract the center line of areas or skeletons of areas with thin >= 0. Smaller values for the thin option will preserve more detail, while negative values will extract only the center line. Voronoi diagrams may be used for nearest-neighbor flood filling. Give the centroids attributes (start with v.db.addcolumn), then optionally convert the result to a raster map with v.to.rast. The extraction of skeletons and center lines with the -s flag is a brute force approach. Faster and more accurate algorithms to extract skeletons from areas exist but are not yet implemented. In the meantime, skeletons and center lines can be simplified with the Douglas-Peucker algorithm: v.generalize method=douglas. This example uses the hospitals in the North Carolina dataset. 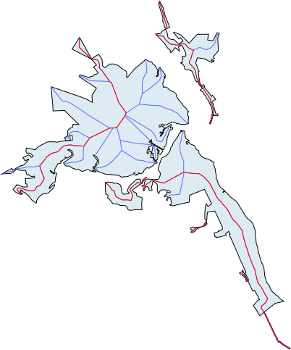 This example uses urban areas in the North Carolina dataset. Steve J. Fortune, (1987). A Sweepline Algorithm for Voronoi Diagrams, Algorithmica 2, 153-174 (DOI).